Fishing for sea run fish like Steelhead and Chinook can be a mental game – some days you will have to work hard for each grab, and other days the stars are just perfectly aligned. In order to get the most enjoyment and pleasure out of the game we strongly recommend that the clothes and fishing tackle your bring are suitable and well balanced for the adventure you have in front of you. Therefore we strongly recommend you to read the following information that focus on “What to Bring” when fishing for Steelhead and Chinook. Fishing for Steelhead during Spring and fall visitors to the lower Skeena valley can expect typical daytime temperatures to range from 0–20C, with everything from bright sunshine to snowflakes possible; the region is part of a vast coastal rainforest and weather patterns can vary dramatically from day to day, and even hour to hour. With this being the case, your clothing strategy should be based on a four-layer system. By utilizing a system of layers, anglers can adapt to changing temperatures and weather patterns and be prepared for any of Mother Nature’s moods. Here is a suggested formula for maximum comfort and flexibility. Layer 1: Begin with a synthetic or merino wool wicking-type base layer that breathes and removes moisture from the skin — very important for maintaining comfort and/or warmth for the entire body. Base layer underwear and socks can be found in three weights: light, medium and expedition. According to your individual metabolism and the stated temperature range, choose the weight best for you. Most guests will comfortable with medium or expedition weight during this season. Garments include: long-sleeved shirts/pullovers, long underwear, and wicking socks. Layer 2: The second or alternative layer should be a medium weight fleece or wool sweater/zippered pullover. For your feet, choose SmartWool, heavy fleece or expedition weight merino wool socks. This layer is an insulating layer that provides warmth for your upper body and feet. Garments include: sweater/zippered pullover and heavy socks. Layer 3: The third layer is a fleece, wool, down or Nano-puff style jacket to maintain warmth on the upper body. For the legs, chose fleece pants in various weights depending on river water temperature and weather. This layer provides additional insulating warmth for the entire body. *The purpose for Layers 1 through 3 are to remove moisture from the skin and trap the warmth generated by your body, thus keeping you warm, dry, and fishing all day long, even in chilly, wet conditions. Layer 4: The outermost layer is a breathable waterproof layer — your rain jacket and waders. Hooded rain jacket: High quality Gore-Tex type products are the best, but they must be seam sealed and of quality construction to perform properly. In North America, Simms and Patagonia make excellent Gore-Tex rain gear. Rain jackets specifically designed for fly fishing are best. Waders and wading belt: Gore-Tex or breathable waders are highly recommended. These waders provide a breathable waterproof barrier that maintains your warmth and comfort throughout a day of fishing. A wading belt should always be worn with your waders for safety. In North America, Simms and Patagonia make the best performing and highest quality waders and wading gear. Wading boots: Felt-soled wading boots are essential for safe wading and all day comfort while standing in the river. However, please ensure that all felt-soled boots are cleaned thoroughly prior to your trip, to ensure that invasive species like Didymo or mud snails are not transported to BC’s rivers. High quality wading boots also provide excellent ankle support and are exceptional for hiking to and from rivers. Vibram soles are available on many boots and are a good second choice. Studded boots are generally not required on Skeena region rivers, but are acceptable if you feel more secure wearing them. Note: Ensure your wading boots are large enough to accommodate two pairs of socks. Gloves: Wool or fleece fingerless gloves are great for wind-chilled boat rides or for fishing on cooler days and mornings. Hats/caps: It is recommended that you bring your favorite “nice weather” lucky fishing hat! This hat should have a good-sized brim (with dark underside) to shade your eyes during sunny conditions. A second wool or fleece-lined hat should be brought to serve you on wind-chilled boat rides and during cold/wet weather. This hat should be capable of covering your ears. The following is a list of miscellaneous but essential equipment you will need during a day’s fishing in the Skeena region. Fishing vest/hip-pack/chest-pack: Rain jackets designed for fly fishing generally have enough storage for fly boxes, tippet materials and other items. However, a vest, hip-pack or chest-pack may be useful to carry additional items or reduce the weight or bulk of your jacket. Boat bag or backpack: A waterproof boat bag or dry bag is very handy for storing extra clothes, tackle, camera equipment, etc. Line clippers, pliers/hemostats, and hook file/sharpener: These are essential items to carry on the river. Steelhead have tough, bony mouths and are notoriously hard-fighting fish. All steelhead fishing in British Columbia must be with single, barbless hooks. 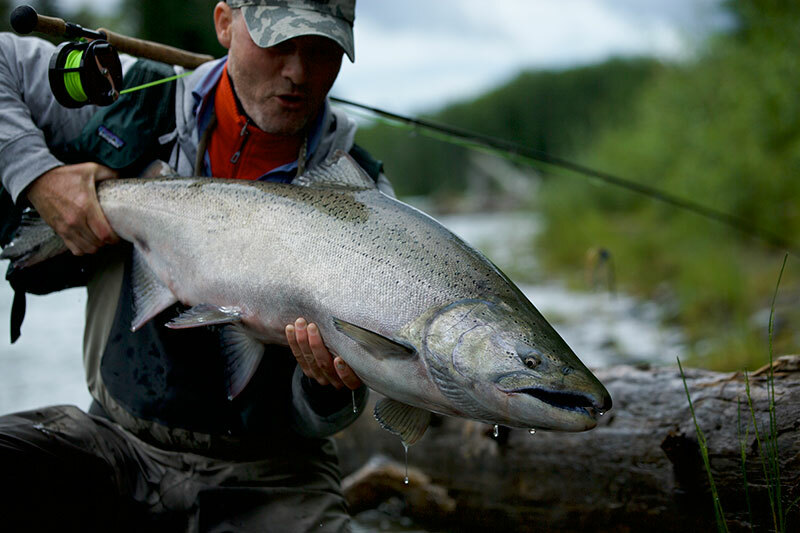 Therefore, the angler with the sharpest hooks often catches the most steelhead. For steelhead fishing, a high quality hook file is a wise investment! Camera: Waterproof or splash-proof digital cameras are handy and help take great photos on your trip. Polarized sunglasses: High quality polarized sunglasses are a must. Not only will polarized sunglasses protect your eyes from an errant back cast and reduce unwanted glare, they may also help you see that steelhead following your fly as it swings to shore! Sunglasses also help reduce windburn on your eyes while motoring up and down the river in jet boats. Bring a backup pair, as well. Fly Rods: The fly rod is probably the single most important piece of equipment in the fly fishing arsenal. Double-handed rods have become the rod of choice for most Skeena anglers, however, an angler competent in casting sinking tip lines with a single-hand rod can still do well. Single-handed rods should be at least 9 feet in length. Many steelhead anglers who fish single-handed rods prefer 9.5-foot or 10-foot rods for more effective line control and mending. Double-handed (spey) rods are another option and offer a definite advantage in most situations. These longer rods allow the angler to cast longer distances with very little room for a back cast. Double-handed rods also offer superior line control and mending capabilities. For most steelhead fishing, we recommend bringing one longer, heavier spey rod, and one lighter, shorter spey rod (or switch rod) to cover different rivers and applications. The longer rod should be 13 to 15 feet and rated for line weights 7–9. This rod will be used for fishing large flies and sink tips. The lighter spey rod/switch rod should be 10.5 to 12 feet long and rated for line weights 6–8. These rods will typically be for fishing smaller flies and lighter tips on smaller streams. 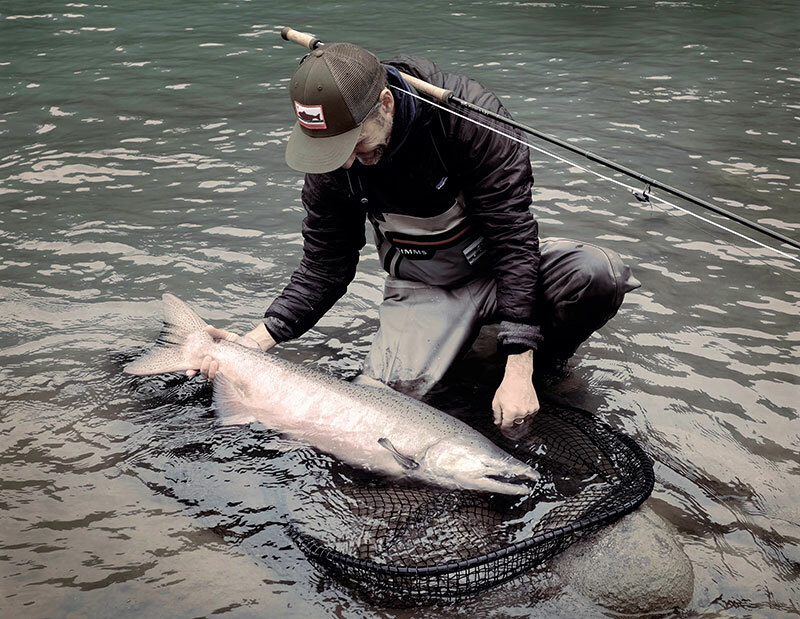 Overall, whether casting a single-handed or double-handed rod, a 7- to 9-weight rod is the perfect choice for steelhead fly fishing in British Columbia. Rods in this range can generally handle 8–20 pound steelhead and have enough power in reserve to battle the Skeena’s larger steelhead, which can reach 30 pounds — or more, in rare instances. Perhaps most importantly, rods in this range can also cast the wide array of lines required to cover the numerous conditions possible on your trip — from floating lines to fast-sinking 300 grain tips. You should bring at least two rods on your trip. The extra rod(s) will not only serve as spares in the event of breakage, but will also allow you to set up multiple rods for varying conditions. 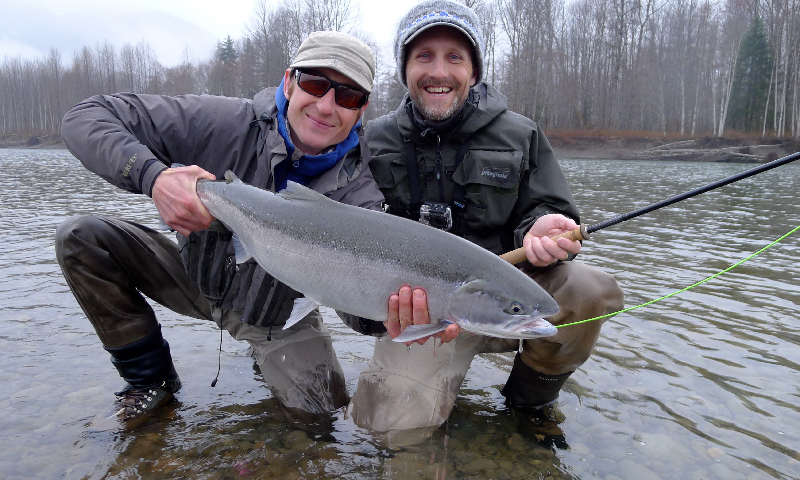 Fly Line and Leader: During your Skeena week, you will be fishing a variety of water types and sizes, from small tributaries to the broad lower main channel Skeena. Therefore, not one commercially produced fly line will cover all water types and rivers. The following lines will be needed to effectively fish most of the water you will encounter. Lines for single-handed rods: A weight-forward multi-tip line is recommended. Note: When selecting a Skagit head and sink tip combination for best casting performance, the accepted rule of thumb is that the Skagit head length plus sink tip length should equal 3 to 3.5 times rod length. Leader systems: The leader is the final connection between you and the fish. Therefore, it must be strong enough to land the fish in a reasonable amount of time but subtle enough to avoid alerting the fish that the fly is not natural. In general, sink tip leaders should be 2.5 to 5 feet long — longer in that range if your fly is weighted heavily and shorter in that range if your fly is not weighted or lightly weighted. Maxima Ultragreen is a nearly universal choice for steelhead anglers in British Columbia. Breaking strains from 12 lb test to 20 lb test are most frequently used, with 15 lb being typical for most wet fly fishing. The reason for a short leader is to get the fly down with the sink tip as quickly as possible and keep it in the fish’s strike zone as long as possible. Although your guide will have flies for you, it is a good idea to bring a selection of flies. Many of the patterns listed below are commercially tied and available at reputable fly shops. If you tie your own flies, please read on for information on characteristics that your hand-tied flies should incorporate. For the most part, steelhead and salmon wet flies should be of fairly good size, from 2-5 inches in length. Traditional style flies should be tied on top quality hook sizes from 4 to 2/0. Some of the key elements in steelhead wet flies (in order of importance) are motion, sink rate, size, color and flash. Motion: A fly with wiggle and motion generally has much better fish attracting qualities since it looks “alive” in the water. This is a highly attractive quality for steelhead. Materials that help impart motion are rabbit fur, marabou, soft webby hackles, dubbings and mohair. Size and Color: In general, the lower and clearer the water, the smaller and more subdued the fly, and vice versa. Favorite colors for wet flies are pink (cerise and salmon pink), purple, black, blue, orange and chartreuse. Don’t be afraid to mix and match colors; favorite color combinations are cerise/salmon pink, black/blue, blue/purple and cerise/orange. Flash: Small amounts of flash included in standard patterns may help induce strikes from a following fish. And sometimes flies that are all flash are very effective in high, dirty water conditions. Many modern materials can help impart flash in your flies such as Flashabou, Crystal Flash, Cactus Chenille, Angel Hair, Edge Bright and many others. 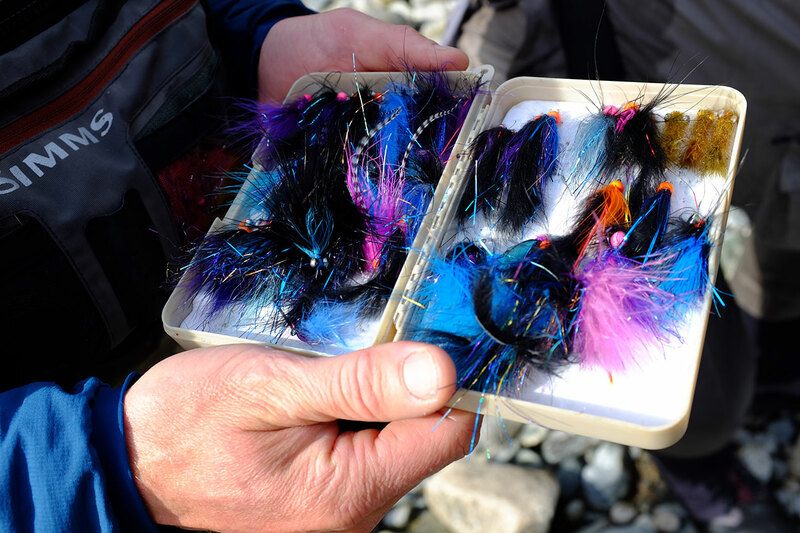 Favorite Wet Fly Patterns at Nicholas Dean Outdoors: Intruder and Intruder variations, Pick ‘Yer’ Pocket, Popsicle, Fish Taco, Starlight Leech, String Leech, Egg Sucking Leech, Trailer Trash, Bunny Bou, Hawaiian Punch, Skeena Series, Terrace Flasher, Skeena Flasher. Beside the daily supplies from your Fishing guide, you will have several opportunities to buy flies on one of the many local fly tackle shops in Terrace. The weather can be very unpredictable even during the summer period in BC. and it can change radically within very short time so it will be very sensible to bring both something that will keep you warm and dry in rainy and windy day and on the other hand something that is more comfortable, when the sun is dancing for 18 odd hours a day. Hooded rain jacket: High quality Gore-Tex type products are the best, but they must be seam sealed and of quality construction to perform properly. Simms and Patagonia make excellent Gore-Tex rain gear. Rain jackets specifically designed for fly fishing are best. Waders and wading belt: Gore-Tex or breathable waders are highly recommended. These waders provide a breathable waterproof barrier that maintains your warmth and comfort throughout a day of fishing. A wading belt should always be worn with your waders for safety. Simms and Patagonia make the best performing and highest quality waders and wading gear. The consensus among guides and experienced Chinook fly fishers is that rods should be short and stout, and reels should be able to stop a speeding truck. In Chinook fly fishing, more so than in any other fresh water fly fishing, your reel’s braking capability can play a huge role in whether or not you ever see the fish you’ve hooked. If it sticks or doesn’t react precisely to on-the-fly adjustments, don’t use it. A guide endorsed rig might consist of a 13-foot double-handed rod for a 9- or 10-weight line, a saltwater reel capable of holding over 200 yards of 30-pound backing, 100 feet of 30-pound-test running line, a 650- to 750-grain Skagit head, and a sinking tip made of 10 to 20 feet of T-14, T-17, or T-20, if you really want to get down and dirty. RIO’s Heavy MOW Tips use the same tungsten “T” designation but come in a neatly packaged set of tips with different lengths of sinking line and a rear floating portion you can loop directly to your Skagit line. The floating-to-floating connection reduces the hinging effect you can get while casting, and as a result, MOW Tips have become incredibly popular with Chinook anglers. To connect the fly, use a short section of 20- or 25-pound nylon monofilament. Long leaders allow your fly to ride up, short leaders keep your fly right in the face of prospective customers. On the business end of the leader, specific fly pattern is generally not critical. But design is. Large silhouette, ample flash and movement, and varying degrees of buoyancy are key elements in the construction of an effective Chinook fly. Intruders, rabbit leeches, and wrapped marabou on tubes or shanks with #1 to 1/0 trailing hooks are the most common. Blue and chartreuse is a killer combination, and standard steelhead colors such as pink, orange, red, purple, black, and blue will all work at one time or another. An ocean-bright chinook over 20 pounds — they’ll go 60 or better, depending on the river — will test your skill, as well as every element of your tackle. A landing rate of 50 percent is commendable. Unless you’re very lucky, you just don’t land all the fish you hook. Each item in your rig is important in the equation. However, paying close attention to three things can greatly improve the score. 1) Leader material should always be fresh and leaders changed every day and after every fish. Intense summer sun and the abrasive glacial rivers can quickly cloud monofilament and weaken it. 2) Choose burly knots such as a triple surgeon’s for looping leaders to sink tips and use a no-slip mono loop at the fly. Chinook salmon tend to hold in deeper, structured runs, and your leader will spend a good deal of time grinding on the stones. A visibly abraded knot will likely fail and should be immediately retied. Snap-test all mono knots each morning and frequently throughout the day. 3) Use heavy-wire, short-shank hooks such as the Mustad 60500BLN size 1/0 for both tube and shank-style flies and use a proper hook hone to keep them sharp. Thinner-wire hooks may be sharper out of the package, but they will bend open and can continue cutting, perhaps even completely though the mandible of a Chinook over the course of a protracted battle. In my experience with spring and summer Chinooks, there is little issue getting the hook to penetrate — grabs can be thunderous. Keeping the hook the in, however, is a different matter. King salmon are notoriously strong, and undoubtedly, there is a physical requirement in pursuing them with a fly rod. But often it is the diligent, meticulous angler who earns the most time with a hooked fish. As the flies for Chinook in general are big and special designed, will recommend you use the flies your Fishing guides will supply you with or to visit our Local Tackle dealer in Terrace.